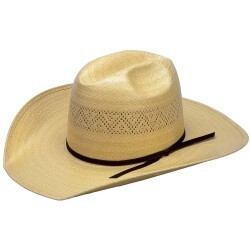 This American Hat Company wheat straw has a 4" brim and is creased with the Minnick crown and the sides turned up slightly. Westernhats does not stock this American Hat but we would love to order it for you. Please allow 2-3 weeks for American Hat Company to build this hat for you. If you would like to order please call us at 800-562-4287.